Poisons can be found everywhere in the home, and even seemingly harmless items can become dangerous if swallowed. In the U.S., more than half of all exposures to poison occur in children younger than 6 years of age. Poisons can be found everywhere in the home, and even seemingly harmless items can become dangerous if swallowed. In the U.S., more than half of all exposures to poison occur in children younger than 6 years of age. 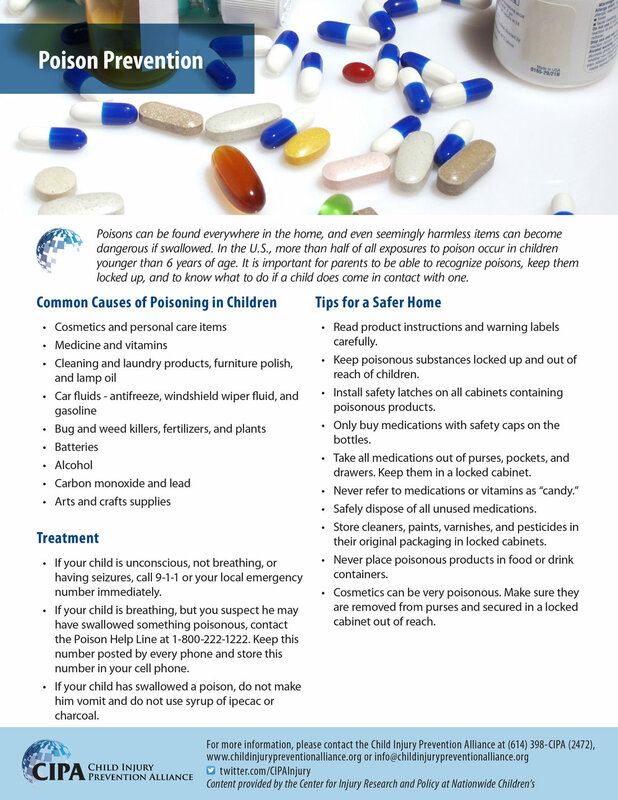 It is important for parents to be able to recognize poisons, keep them locked up, and know what to do if a child does come in contact with one. If your child is unconscious, not breathing, or having seizures, call 9-1-1 or your local emergency number immediately. If your child is breathing, but you suspect he may have swallowed something poisonous, contact the Poison Help Line at 1-800-222-1222. Keep this number posted by every phone and store this number in your cell phone. If your child has swallowed a poison, do not make him vomit and do not use syrup of ipecac or charcoal. Read product instructions and warning labels carefully. Keep poisonous substances locked up and out of reach of children. Install safety latches on all cabinets containing poisonous products. Only buy medications with safety caps on the bottles. Take all medications out of purses, pockets, and drawers. Keep them in a locked cabinet. Never refer to medications or vitamins as “candy.” Safely dispose of all unused medications. Store cleaners, paints, varnishes, and pesticides in their original packaging in locked cabinets. Cosmetics can be very poisonous. Make sure they are removed from purses and secured in a locked cabinet out of reach.